Southampton continues to stay strong in the Barcley’s Premier League, and for me it’s no fluke… in the first part of my two part analyses of the Saints I’ll peel back how they are doing in Attack. Most of you know by now that the Possession with Purpose Family of Indices are some of the most relevant Indices in modern-day soccer statistical calculations. So when looking at the combined efforts of Southampton (cradle to grave in both Attacking and Defending Team performance) their should be no surprise they are where they are in the League Table. Notice that even with declining Possession, and a slight drop in overall Passing Accuracy, their levels of Penetration remain roughly the same – mathematically speaking the trend-line shown for Penetration is y = 0.000x +.231 – meaning there is a slight positive slope, over the course of 22 games as compared to the negative slope (trend-line) for Possession and Passing Accuracy. For me, I’d offer this is down to better understanding what areas of Penetration are more vital in trying to defeat opponents than simply the pure aesthetics of the game. 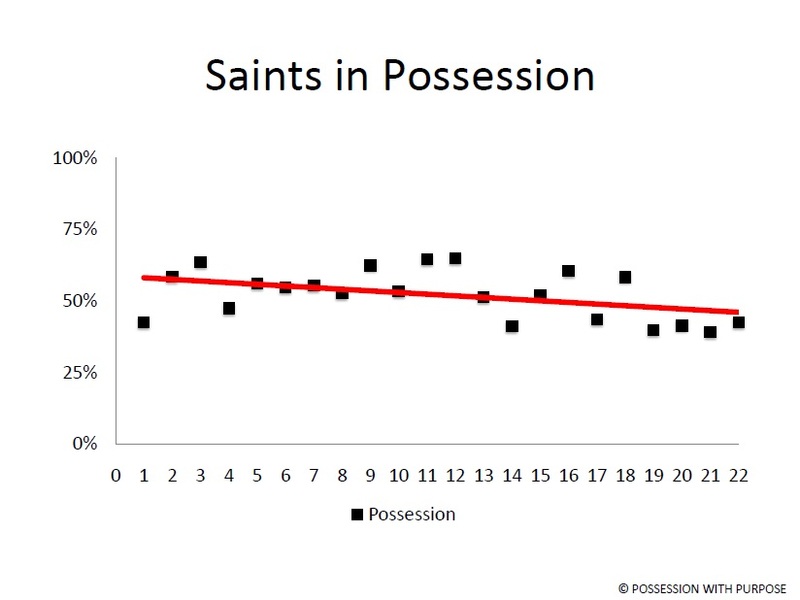 Although Possession, on the Aggregate has an R2 of .77 for all teams compared to Points in the League Table, Possession – itself – alone – game to game – through the course of 22 games for Southampton, has virtually NO reasonable relationship to Points Earned – the R2 is .059. 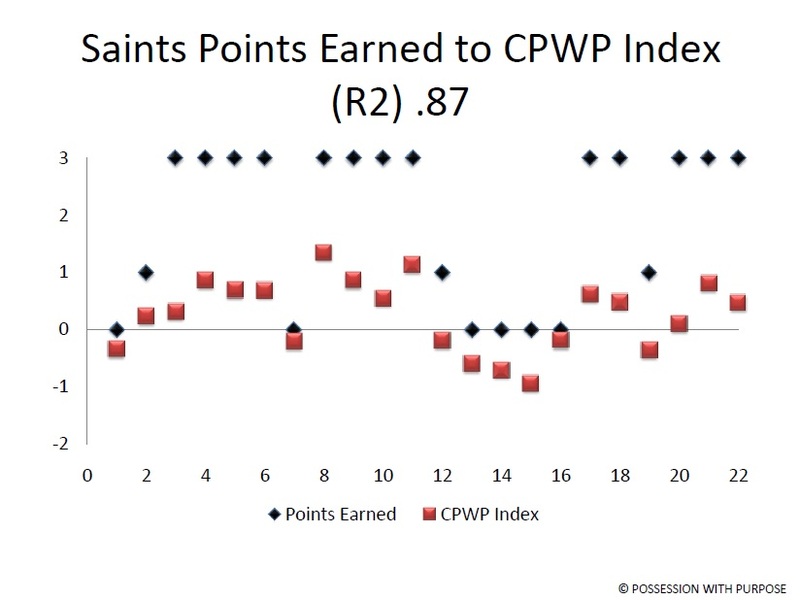 Finally, you guessed it – the R2 for physical penetration, with the ball, has an R2 of -.18 – again, meaning there is NO reasonable relationship to Points Earned. In comparing the Saints to other teams in the Barcley’s Premier League they are 8th highest in overall Possession, 10th best in overall Passing Accuracy and 7th lowest in overall Penetration. 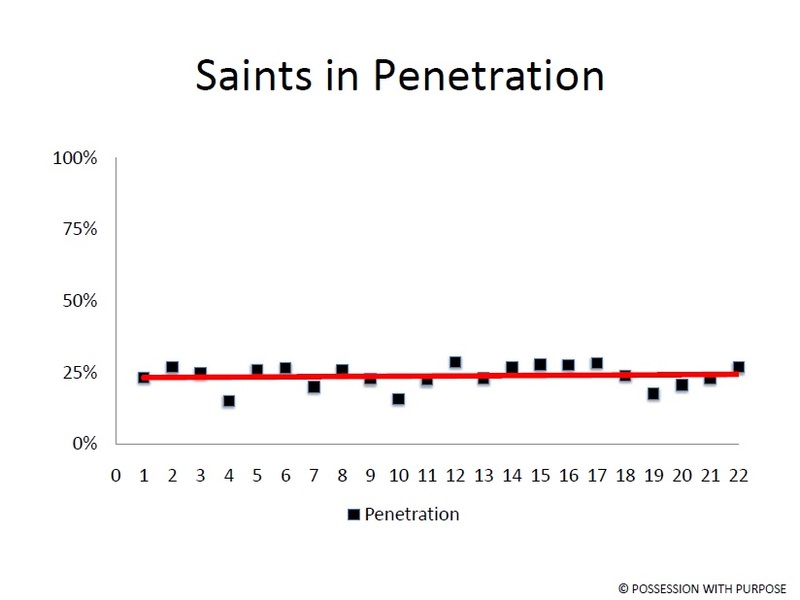 Throughout the course of the season the Saints, like in Penetration, have been very consistent in creating shots per penetration – their variation, across 22 games has been 4% from the mean – a similar variation with respect to Penetration as well. Notice that with the relative consistency of Shots Taken – their percentage of Shots on Goal per Shots Taken has dropped but yet their percentage of Goals Scored per Shots on Goal has increased. I put this down to making better use of time and space and perhaps??? a slight change in tactics to work from a more counter-attacking approach. 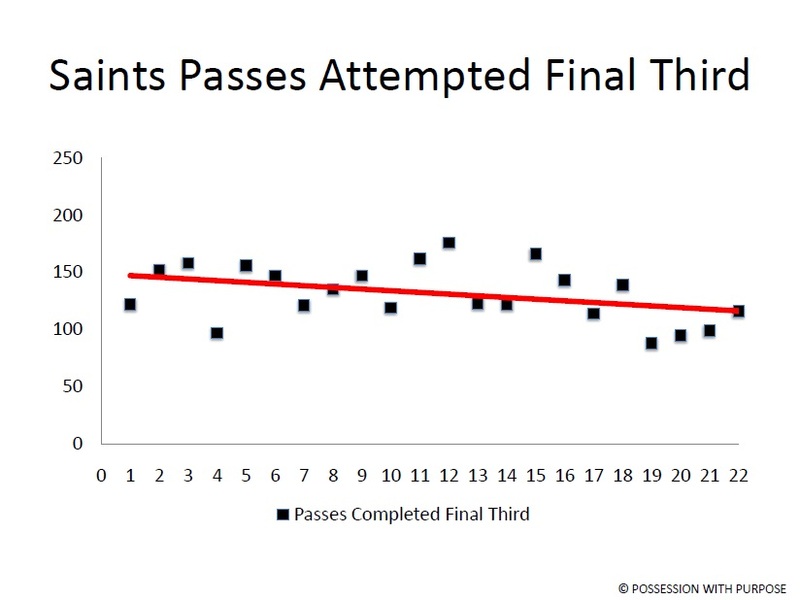 Recall that both Possession percentage and Passing Accuracy have dropped over the course of 22 games. In studying other teams, with those trends, in Major League Soccer, the Bundesliga, and La Liga, it usually indicates a slight change in Defending tactics to help open up additional time and space in a counter-attacking based approach. Perhaps??? 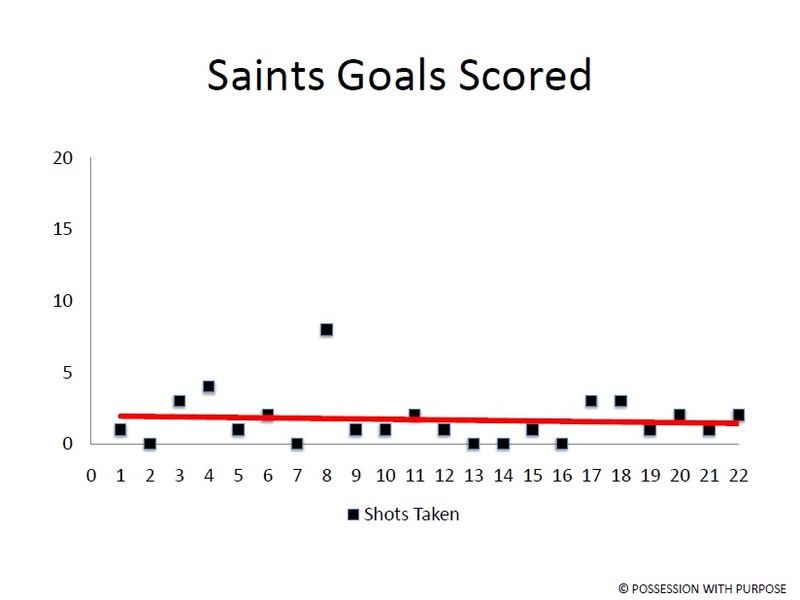 another thought is that as more teams become aware of Southampton’s ability to ‘win’ consistently the Saints are having to revert to other tactical approaches, outside the standard possession-based approach, used more often by teams like Man City or Chelsea. 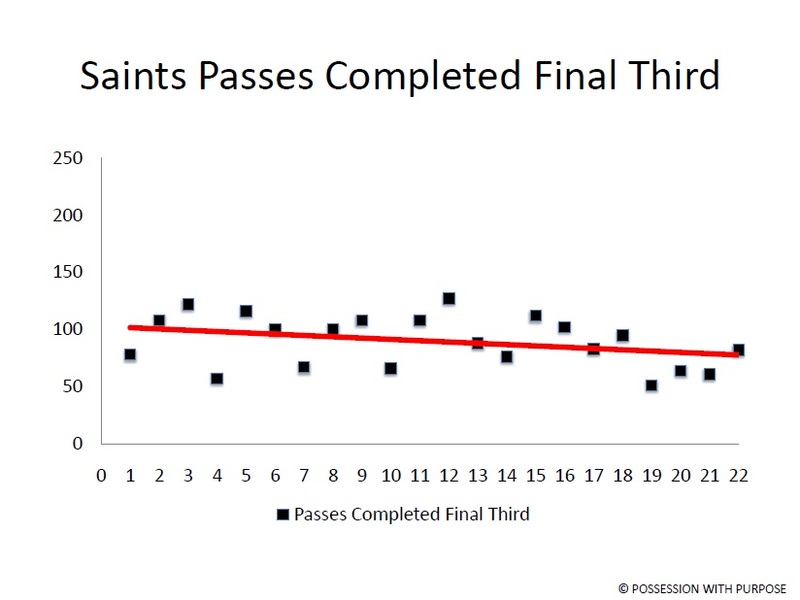 I suppose I sound like a broken record here but time and time again the soccer pundits on TV continue to harp on about Possession (more possession) being a good indicator that a team will win… it simply isn’t true! 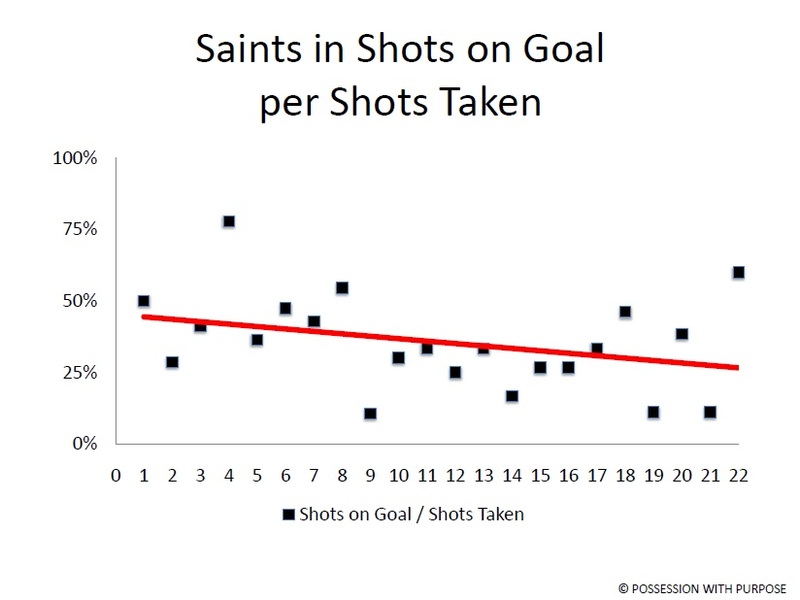 In terms of overall averages, compared to the rest of BPL, the Saints are 8th lowest in Shots Taken per Penetration, 3rd highest in Shots on Goal per Shots Taken, and 5th highest in Goals Scored per Shots on Goal. So even with the marked decrease in Shots on Goal per Shots Taken (diagram above) they are still 3rd highest in average compared to the rest of BPL. Pretty obvious that there is a downward trend across the span of 22 games for Southampton, yet they continue to earn points – in an ideal business environment the best word to represent this type of activity is “efficiency” – getting more with less… and it’s not all about quantity – it’s about quality! 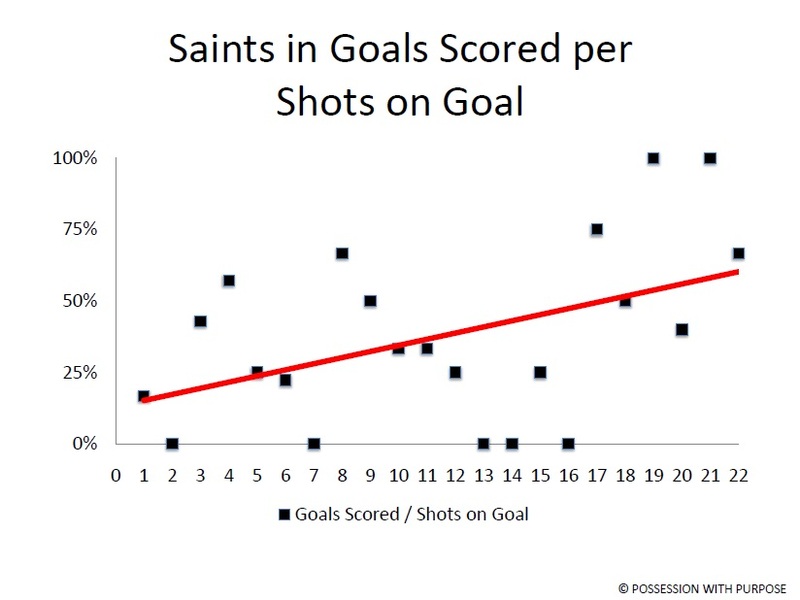 More to follow later this week on the Saints and their quality and quantity in Defending team performance. Do you have any data that says that their high conversion rate (goals scored per shot on target) is sustainable? I’ve only just discovered your (impressive) work thanks to a mention by Tim on a podcast a couple weeks ago, so I’m still trying to get my head around it. It seems to me that the increase in conversion is covering for their decrease in shot on target percentage and that may be in fact an indicator that they are due to regress. Is that reasonable or no? In terms of regressing – the trend-lines do seem to indicate a regression (a drop in overall percentages) since I don’t track individual players it’s hard to say about Southampton – but Schneiderlin (Spelling???) has been injured and if his presence is significant relative to some percentages then his missing may be an issue. If that is the case it is interesting that his replacement has been able to help the team either 1) withstand the loss and sustain the same approach – or 2) Koeman has had to slightly adjust the approach and even with the drop in overall percentages (accuracy) the team has sustained performance. I’m not sure that helps – but it will be interesting to watch their week to week performance as the season continues… and one tricky thing about forecasting – to predict you really need at least 15 home games and 15 away games to hit a 95% level of confidence on what the future may hold – so even now I would caution that the real trend line has yet to be confirmed as we are only 22 games in…? ?